Finally, a new book maps out the contours of the time-tested strategic partnership between Russia and India in the 21st century. 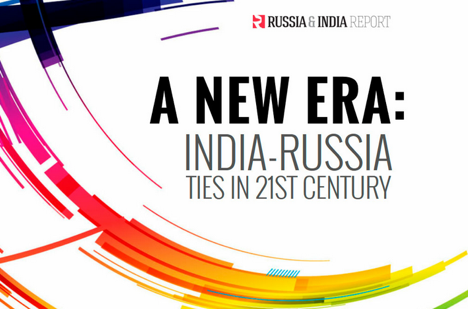 “A New Era: India-Russia Ties in the 21st Century,” a 174-page hardbound volume, replete with captivating photographs, comprises essays by top Indian and Russian scholars and experts unveiling the potential of the two countries in forging a full-blooded partnership in the coming decades. The Soviet collapse in December 1991 and emergence of a multipolar world order has posed a multitude of challenges for countries like India not involved in the Cold War by maintaining their strategic autonomy through many instruments of international politics like non-alignment or neutrality. As India was busy in making a niche for itself in the rapidly emerging uni-polar world order, Russia, on the other hand, was reaping the benefits of the end of Cold War for its rapid integration into the mainstream economic and political processes ongoing in Europe. The image of its old and time-tested ally, Russia, was fading in the Indian mind. If it were not the problems of the Indian armed forces, heavily dependent on the Soviet-supplied military hardware, Russia would have totally disappeared from the Indian radar. The static images of each other were enlivened and animated only after 2000, when President Vladimir Putin’s government signed strategic partnership treaty with India led by Prime Minister Atal Bihari Vajpayee. This was a great leap forward in bilateral relations as such, but in the absence of a philosophy of growth it lacked the dynamics. In this context, the release of a book by the Chairman of Russian State Duma, Sergei Naryshkin, during his recent New Delhi visit could be described as a prudent endeavour to chart the course of bilateral sailing in the unknown waters of an emerging polycentric world order, which no doubt will be influenced by the movements of Eurasian nuclear giant Russia and India, a rising Asian giant. “A New Era: India-Russia Ties in the 21st Century” is the collaborative work of Russia Beyond the Headlines, an international project of Moscow-based Rossiyskaya Gazetadaily, New Delhi based think tank Observer Research Foundation (ORF), the Russian International Affairs Council (RIAC) and the Times of India Group. The 174-page hardbound volume, replete with numerous photos, illustrations and maps, is a collection of essays and in-depth analyses by top Indian and Russian scholars and experts unveiling the potential and capabilities of the two countries in forging a full-blooded partnership in the coming decades. Unlike in the recent publications, mostly dealing on the analyses of the past successes and drawbacks the authors in the new volume, focus attention on the concrete ways of infusing new ideas and content into the bilateral strategic partnership. In the introduction penned by the new generation Russian foreign policy ‘pundit’ Fyodor Lukyanov, the book notes that India and Russia are a rare case when the expression ‘time-tested partnership’ is not a cliché. Dr Dmitri Trenin, head of Carnegie Moscow Centre, notes that year 2014 was a turning point in history of Putin’s Russia, when Moscow upset the post-Cold War order in Europe over the Ukraine crisis and India, which overwhelmingly elected Narendra Modi as prime minister, who has ‘dramatically energised’ the country’s foreign policy. Moscow’s challenge to the US hegemony and India’s quest for the role of a global power and engagement with the neighbouring Asian and Indo-Pacific powers are aimed at playing an active roles in the formation of the new world order, Dr Trenin notes. Eminent Indian and Russian economists Mohan Guruswamy and Prof Konstantin Korischenko note the importance of the India-Russia interaction within the BRICS grouping for bringing changes in the global financial governance architecture, based on Bretton Woods agreements of the Western powers. Russian defence expert Konstantin Makienko and Sanjeev S. Ahluwalia, a former Indian official, have identified defence and energy, including civil nuclear, as the pillars of bilateral security partnership. These are just a few examples of the issues raised by the authors of the book which covers all aspects of the human activities where the two countries need to overcome past stereotypes and fashion a defining relationship for the 21st century. Editors of the book, Konstantin Fets and Nandan Unnikrishnan, with their editorial team deserve special thanks for the highly professional compilation and illustrations, which will certainly attract readers. The book which is expected to hit the stalls in April, will no doubt be an invaluable asset not only for journalists, experts and scholars, but also be an invaluable source for the students and researchers of the international relations and bilateral India-Russia strategic partnership. Pre-orders of the print version of the book can be made at: http://book.in.rbth.com.